Caravanning Australia goes all over the outback this edition! Join us as we journey through Australia’s outback, stopping at charming country towns, seeking out exciting outback adventures and attractions, and basking in divine desert landscapes. From Queensland’s Overlander’s Way and New South Wales’s Darling River Red Run, to South Australia’s Flinders Ranges and Western Australia’s Golden Outback, we bring you the best of the best this season – plus tips on where to go this snow season, just for good measure. Also covered is The Explorers Way, cutting through the dusty centre of Australia on a journey from Adelaide to Darwin. We also share our top Queensland coastal retreats for those seeking the sun and sand, as well as our top picks for Western Australia’s South West region. Also on offer are puzzles, cooking ideas for campers, caravan buying guide, must-have accessories, the latest apps to make travelling a breeze, and much more! 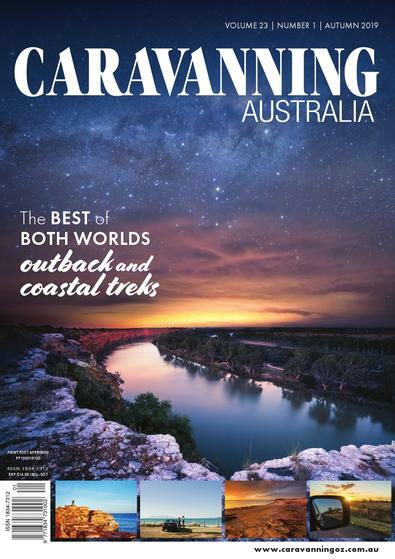 Don’t leave home without this latest edition of Caravanning Australia. I just discovered this magazine in our newsagency, and was pretty impressed. So much information about places to go, instead of heaps of caravan reviews and the like. We love it – very different from other caravan magazines, and really high quality. For quarterly titles please allow up to 10-13 weeks for your first delivery. Your subscription will begin with the next available issue.